In one of the more interesting collaborations you’ll come across, craft brewery Dogfish Head has created a new beer that can actually process Kodak Super 8 Film. That’s right, we’re talking about a beer that can process film. SuperEIGHT, which will be released in 12-oz cans nationally in April 2019, is a gose beer that was already under development when coincidence struck. Dogfish Head likes to say that they make “analog beer for the digital age.” So when Dogfish founder and CEO Sam Calagione stopped by The Kodakery podcast to chat about analog processes, imagine his surprise when he discovered that the beer they were developing could have a dual purpose. SuperEIGHT beer includes special ingredients: prickly pear, mango, boysenberry, blackberry, raspberry, elderberry, kiwi juices, toasted quinoa and an ample addition of red Hawaiian sea salt. Not only do these ingredients give the 5.3% ABV beer a red color and tart taste, they also make it quite acidic. As Calagione learned that day on the podcast, beers with low PH levels and high vitamin C can actually be used as a processing agent for film. With this in mind, the Dogfish team continued to develop what would eventually become SuperEIGHT, a tasty beer with a special skill. To ensure that SuperEIGHT would really work as a processing agent, Dogfish sent early batches over to Kodak for testing, so there’s no denying the hidden superpower this beer contains. If you want to try it for yourself, Kodak has their recipe for developing KODAK TRI-X Reversal Film in Super 8 format available for download. Craft brewery Dogfish Head has created a new beer that can process Kodak Super 8 Film. 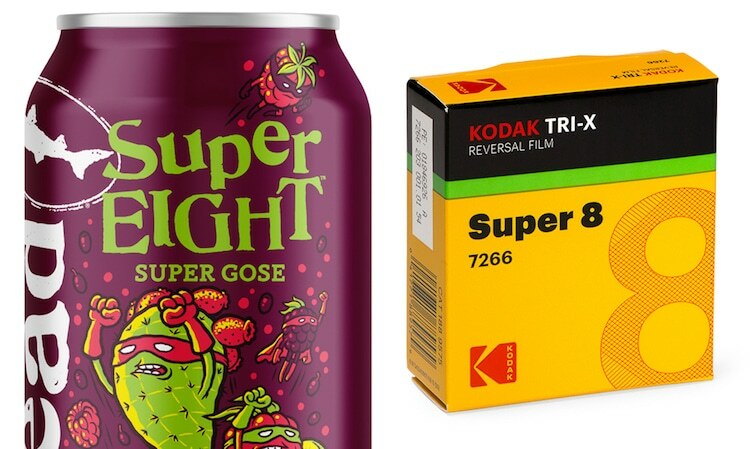 Watch this video to see a clip shot on Kodak Super 8 Film and hand developed using SuperEIGHT beer. The post This Craft Beer Was Created to Develop Kodak Super 8 Film appeared first on My Modern Met.